This is the pattern Maggie Brown used to create the flowers we made as table decorations for Tat Days.Â Th pattern can also be found on Patricia Lyn Cobb’s blog “Tatting Treasures” in a post dated August 1, 2010.Â The pattern results in a beautiful flower that made lovely accents for Tat Days participants.Â Many thanks to Ms Cobb as well as Ms Brown for their efforts! String 98 beads. 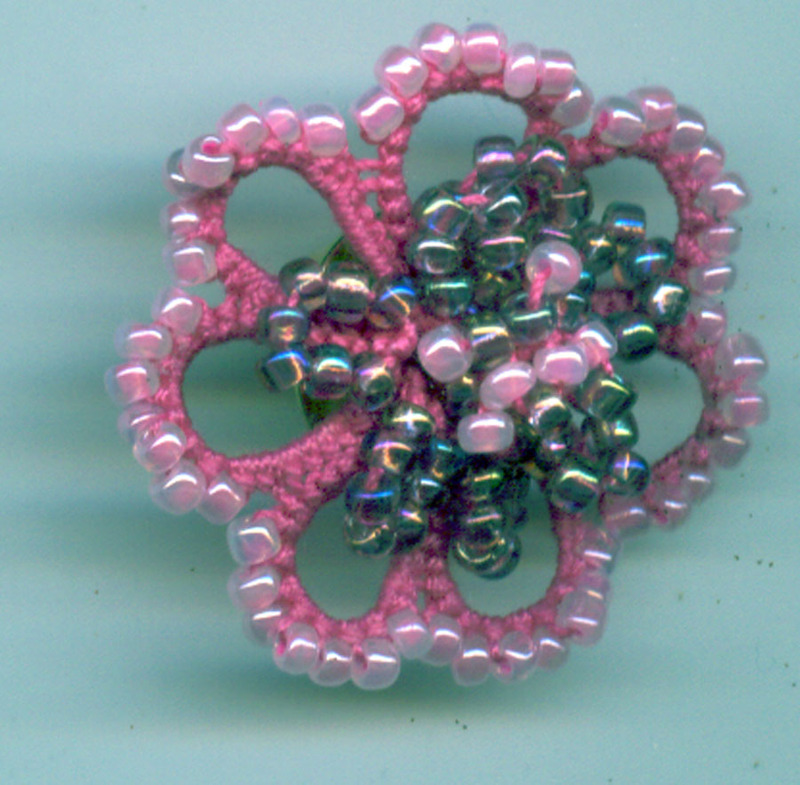 To make like my original pin that I made at the Lace Escape, String 7 of color A, 7 of color B, 7 of color A, 7 of color B, etc. 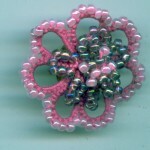 Most of the other pins that I made, I used a single color. Ring 1: (Place 7 beads on the back of the hand) 7ds, vsp, 2ds, 1B, 1ds, 1B, 1ds, 1B, 1ds, 1B, 1ds, 1B, 1ds, 1B, 1ds, 1B, 2ds vsp, 7ds, close ring. Ring cluster: (Place 7 beads on the back of the hand) 1 ds, 7b, 1ds, close ring. Rings 2-6: (Place 7 beads on the back of the hand) 7ds, + (to last picot made), 2ds, 1B, 1ds, 1B, 1ds, 1B, 1ds, 1B, 1ds, 1B, 1ds, 1B, 1ds, 1B, 2ds, vsp, 7ds, close ring. Follow with a ring cluster. Ring 7: (Place 7 beads on the back of the hand) 7ds, +, 2ds, 1B, 1ds, 1B, 1ds, 1B, 1ds, 1B, 1ds, 1B, 1ds, 1B, 1ds, 1B, 2ds, + (to first picot on Ring 1), 7ds, close ring. Follow with ring cluster and tie off to the base of Ring 1. Inner ring cluster. String 18 beads. Ring: 1ds, 3B, 1ds, 3B, 1ds, 3B, 1ds, 3B, 1ds, 3B, 1ds, 3B, 1ds, close ring. Insert in the center of the flower.